"a stunning Deluxe Limited Edition, featuring eight new full-color works of art and several ornamentation illustrations by nine-time Hugo Award-winning artist Bob Eggleton, commissioned exclusively for this volume. Each book is personally signed by the artist." "I think this is EP acting like the LEC"
While I understand the point you are making, publishing a few overpriced "deluxe" editions of out of copyright titles does not really come close to what George Macy accomplished with the LEC. There is no letterpress printing, no regular subscription, no monthly letters, and with the possible exception of this volume, no original artwork and rarely any signatures by those involved in the book production. Quite frankly the DLEs from EP are barely distinguishable in quality from their "standard" works, just priced significantly higher and with the added exclusivity of a limited production run with numbered copies. Seems to appeal primarily to two audiences: MBI owners padding their profit margins and resellers hoping to make a profit out of sold out copies of an apparently limited printing, mostly artificially manufactured through clever marketing. That said, I have bought several titles, though I have no interest in this one, not because I have been fooled by the marketing hype, but because it was a book that greatly interested me for one reason or another. In retrospect, while I don't plan to return or resell any DLE titles I've purchased, I certainly don't put them in the same category as even the most pedestrian LEC and I always realized I was vastly overpaying for the privilege of ownership. Not overly impressed with this one judging by the picture on the website. I like the standard Tarzan series they did a few years ago better. I think it looks nice. I wouldn't mind knowing to how many copies it is actually limited to. >4 jlabeatnik:: I noticed the lack of a number too. Can they really call it a "Deluxe Limited Edition" and not tell how many copies there will be? To my understanding this is limited to 800 copies. >5 iluvbeckett:: I've noticed that with more recent announcements of DLEs, E/P often does not immediately indicate the number of copies to which the publication will be limited. The skeptic in me conjectures that they wait to see how much interest there is in the release before determining to how many copies to limit the edition. If there is high initial demand, probably 800 copies, less demand, perhaps 400 copies. In fact, we've previously seen DLE editions initially announced with higher limitations than they actually ended up printing, according to the number of copies indicated on the limitation page of the delivered copies, leading me to believe that the demand was less than they had originally anticipated and subsequently reduced. It makes more sense from a marketing perspective to simply advertise a new release as 'limited' than to advertise it as less limited than it may actually turn out to be, which I suspect is the motive behind the new policy. I believe it will be limited but E/P may not even know yet just how limited. Which leads me back to my same old song ... aren't nearly all E/P editions limited editions, excepting their ongoing subscription series such as 'The 100 Greatest'? I would love to know how much a "normal" printing is, say for a book in the Reader's Choice series, for example. Yes...but I assume that EP will not be reissuing those editions that they've published as a DLE. If they ever do, I would feel seriously misled. 10: Good point ... they probably won't reissue the very same DLE. But what about the Super Deluxe Limited Edition, which might be a previously published Deluxe Limited Edition with a built-in fan, cup holder, arm rest and signatures of all the employees who handled the book during production? Wasn't the Deluxe Limited Edition of Fahrenheit 451 simply a revamped edition of the previously released Signed Modern Classic, with a fancier cover and a slip case? The Signed Modern Classic edition itself was a recycled edition of the Masterpieces of Science Fiction edition but with the inclusion of the author's signature. And isn't the new Tarzan of the Apes a re-make of the previously re-leased edition from the Masterpieces of Science Fiction, but with a few extra illustrations and the artist's signature? I've already noted the previously advertised limited edition of Ulysses that is now part of the Great Books of the Twentieth Century series. Regarding non-deluxe editions, even when Easton does re-issue particular titles, they typically introduce some cosmetic change that makes them unique from previously released issues, so each essentially becomes its own limited edition. I realize I am being somewhat contrarian. I love E/P, including the DLEs, but I question if the dramatic difference in price between a DLE and a standard edition truly reflects added value or merely limited supply. Perhaps I too am feeling a bit manipulated by Easton Press marketing using the 'Limited' stamp as a cheap and easy means of increasing profit margins. 12: indeed. One of the best DLEs I have seen, and frankly in my opinion this is on par with the Limited Editions Club books. The main difference being that LEC books are letterpress. Sure, letterpress would be nice, but it would never be affordable. Overall, a truly amazing book, and make sure to email EP and tell them you want to see more such books printed! Also, this was printed on the 100th anniversary of the publication of Tarzan, which is an added bonus! Not sure, but I think this DLE is now sold out. 14--Doubtful with 800 copies printed. >14 astropi:: It still shows up on their web site as available, for what that's worth. >2 UK_History_Fan: Good to know this is not a letterpress edition. I was wondering about that, and would have considered buying this as my first DLE if it had been. With respect to EP and their printing policies, look at MBI, Inc.'s website and the brief history on there. The owners started the company to make "collectibles", starting with the Danbury Mint. Anyone out to make "collectibles" is 100% about marketing. After owning the EP Jane Austen library for a couple of months, I finally had a chance to look through the books - very poor print quality, and not up to the quality of the HP reprints that EP does. I called EP customer service to ask about this, and was told very quickly that they don't modify the appearance of books from the original edition they are using as the basis for the EP edition (seemed like they were not answering this question for the first time!) So, essentially these are facsimile copies of the "first illustrated edition" from the early 1900s, warts and all! However, this is not stated anywhere in their advertisement or description of the books. (To the credit of EP, the rep had no problem taking them back for a refund, since I was unhappy with them, even though I was well past the 30 days return period.) This just leads me to conclude that EP is putting essentially no effort into the books they issue. They just find a book that is either out of copyright, or to which they own the copyright (the HP catalog), and reprint them in facsimile fashion with a leather cover, which often is not very imaginative. This explains why the 100 Greatest and other books based on HP/George Macy designs are such nice quality. Unfortunately, it means the prospective buyer needs to know something about the original edition of the title that EP is copying. "Anyone out to make "collectibles" is 100% about marketing." "This just leads me to conclude that EP is putting essentially no effort into the books they issue. They just find a book that is either out of copyright, or to which they own the copyright (the HP catalog), and reprint them in facsimile fashion with a leather cover, which often is not very imaginative." I am disappointed to hear about the EP Austen Library. I own this but it is still shrink-wrapped and I have not examined it yet. Yes, I too was very disappointed. I hesitated calling EP about the Austen set, because the exterior is stunning with the red leather, gold stamping and black background to the gold lettering. If one can live with about one lettering defect per page (such as smudged or fuzzy letters, missing punctuation or parts of letters, or even a missing letter near the edge of the printing) then it's a nice set. However, at $60 per book, I expect clear printing. I would have admitted this is not Easton Press's fault if they had advertised the books as facsimile and even shown a sample page on the website and/or in the print catalog, but again, nothing is said about that in their advertising. Sometimes I think they count on people not reading their books. "Sometimes I think they count on people not reading their books." Oh absolutely. I would be surprised if a majority of their customers actually read the books. I imagine they get a good number of people who merely "collect" things for the look rather than the info. "This just leads me to conclude that EP is putting essentially no effort into the books they issue. They just find a book that is either out of copyright, or to which they own the copyright (the HP catalog), and reprint them in facsimile fashion with a leather cover, which often is not very imaginative." I agree 100% and it is why I much prefer Folio Society publications. Even when they go for out of copyright works FS resets the type and almost always pay for newly commissioned illustrations. I have been sorely disappointed with E/P for both using images of the original pages and even more, the poor quality of many of the illustrations in their books. After finding how the illustrations in the E/P edition of Beowulf are supposed to look I created a comparison for the ten illustrations in common with the 1939 Heritage Press (or 1952 Limited Editions Book Club) edition. I was also disappointed to learn that E/P only used 10 of the 12 Ward illustrations. Wow, thanks for sharing that comparison. It's almost like the EP pictures are totally different illustrations than the HP/LEC. The EP colors are so dark and blotchy, pretty bad. I've got a lot of EP books, but I guess I never knew the difference between their illustrations and the originals in the HP editions. Supposedly, the illustrations in the "Famous Editions" series were better than the 100 greatest series, hence the higher price of the famous editions, at least that is what I was told by an EP rep on the phone. >24 EclecticIndulgence: The Leonard Ellery translation of Beowulf was pretty standard when the great illustrated editions of the 20th century (e.g. Random House edition illustrated by Rockwell Kent or the LEC edition illustrated by Lynd Ward) were commissioned. These are beautiful editions; though, for reading purposes I definitely prefer Seamus Heaney and think the FS did a wonderful job with their bilingual deluxe edition. I wouldn't be without any of the three. I don't see Ovid there either. Wasn't it a DLE? Also "London." Their omission might be just an oversight. I recently acquired this volume at a great price. Well worth picking up if you can get it for retail or thereabouts, which you can if you use a little patience. Larger than I had expected, lots of white space, but it looks fine. Illustrations are nice. Overall a nice package for a reasonable price. Lots of photos in the album, click the pic. >30 Wootle: is that my imagination or are there 5 inch margins? If so what possessed EP to design the book like that? The margins are 1.5" and 3" on the sides, and 3" on the bottom. I have no idea what that means but it sounds very erudite. I have found all the page layouts in this series to be pleasant. Most of the stories are fairly short and so allow for significant white space on the pages. The 9x11 format might seem to be unnecessarily large, but it is needed to properly display the art, and yet is comfortable enough to read on one’s lap. Easily one of the best DLEs in my opinion. 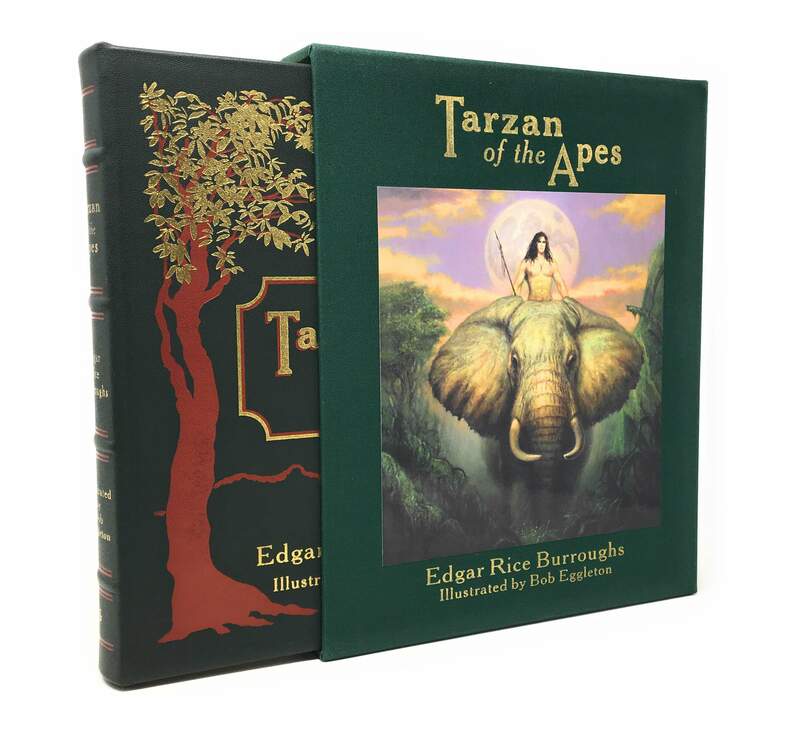 You won't find other "fine editions" of Tarzan, thus this is quite unique, with fabulous illustrations of course. Sorry, I thought I had the movie schedule but it was for the wrong year.